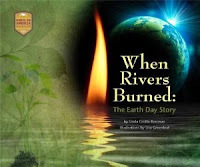 Linda Crotta Brennan's newest book,When Rivers Burned: The Earth Day Story, will have its official book launch on Sunday, April 21, the day before Earth Day. The event will be held at the Audubon Society of Rhode Island's Environmental Education Center from 1 to 4 PM. There will be a book discussion, question and answer session, and book signing. A dollar from every purchase made that day will be donated to the Earth Day Network. Linda, I try to do an environmentally-related post once a week, particularly one related to books. So this was right up my alley. I noticed this cover on the screens at lunch yesterday at the NESCBWI conference.